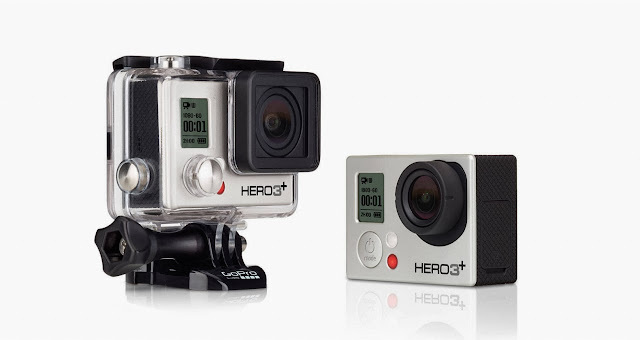 Sethioz Industries Official Blog: GoPro Hero3+ Black Edition Review and Testing! Today I was testing out GoPro Hero3+ Black Edition Actioncam / Camcorder and here's a quick review on this tiny cool device. So what is Hero3+ exactly? Well in short it is ActionCam, designed to be used in sports, such as cycling, parachuting ..etc. It's easy to use and it can be controlled via iPhone's app, even tho via iPhone there is a delay in what Hero3+ sees, it is enough to see what you are recording. Another great feature it has, is the "fish-eye" view, it is ultra wide angled. - Has remote controller that can be used to start/stop recording and change modes and turn it on/off. - Can record up to 240fps @ 480p or 120fps @ 720p, which makes it excellent for sports, where capturing fast movement is important. - Fully waterproof! You can go diving with this device. - Has expansion slots (such as LCD screen can be attached at back) and another Hero3+ can be connected to it. - Uses micro SD card, however any micro SD won't do, you need high-speed SD, a normal one is not enough to record at high resolutions. This is Unboxing, Review, First time Setup and Testing. Underwater test is also included in this video! We'll make more tests soon, underwater test in a bath is coming up and also fast movement test will come. First to mention it is very difficult to unbox this thing, but once you know how to do it, then it seems easy enough and you only unbox it once anyway, so not a big deal. However another issue is more serious, namely sound. When it's in the waterproof case, then audio is practically non-existing, i was standing right next to it talking and on video i was barely able to hear myself and it had horrible quality. It should have a bluetooth microphone or sound coming via iPhone, that would be excellent feature (not 100% sure about iPhone sound tho, it might be possible to capture sound from iPhone).